They hide under bridges and melt into dark forest shadows. They are ugly, menacing and vaguely though evanescently humanoid. They are the glimmers of shape — human shape? — that you were certain you saw out of the corner of your eye yet are gone when you look more closely. There are any number of such strange, possibly malign encounters in the mythology of Iceland and neighbouring northern hemisphere countries and the idea of their elusive 'presence' persists despite the 21st century's cold and unspiritual logic seeming to have rendered them impossible simply by robust denial. 'They' are — or some would argue were — trolls. In Iceland, the most recent 'troll alert' — a warning reporting troll activity especially in remoter districts — was not all that long ago, perhaps 50 years or so, and belief in the mythological troll dies hard: just when the weird and ghostly visitations seem to have become part of an embellished past some new and harrowing manifestation appears attracting the scorn of doubters and cynics and rejuvenating the lore of the troll. The trouble is that trolls were not only tricky to catch a glimpse of — being under bridges and in dark grottoes etc. — but they also metamorphose across the ages. Sometimes they appear to be very old; other encounters feature beings of amazing physical strength but slow-witted; down the centuries they become at times indistinguishable from 'normal' human beings and on other occasions repugnantly ugly. Scandinavian trolls were reputedly frightened of lightning, unable to withstand sunlight (which turned them to stone), and intensely intolerant of church bells — an objection that they would frequently express by stoning the churches. A decline in the number of reported troll incidents was at one time attributed to the proliferation of churches and their cacophonous bells in particular districts. In general, no matter what their varied intrusions in the flux of time, trolls have been regarded as always dangerous, unpredictable, unlikeable at best and — despite some evidence of cunning and calculated deviousness — ignorant. That there is a modern version of the troll is no surprise given the longevity and resilience of the phenomenon. 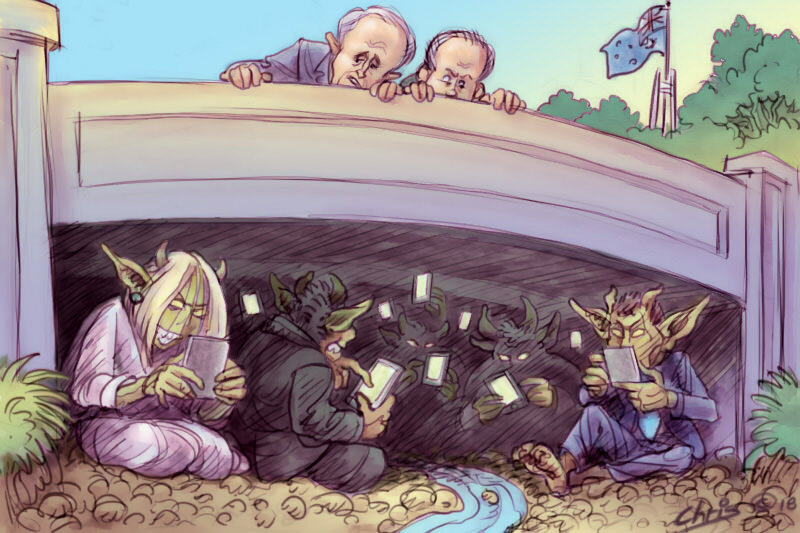 The modern troll still hides under bridges, but the bridge is the internet, a much more attractive (to the troll at least) hideaway than a mere bridge, ditch or thicket because it affords anonymity. "The five years since this study was completed have produced if anything an even more spectacularly scandalous, intermittently paralysed, rough, devious and ungentle Parliament than was examined from 1996 to 2012." In the technological age what we might call essential trollness continues not only unabated but enhanced. With press-button precision, trolls can target individuals of any age, including the young and the vulnerable and can exercise the sort of baseless, cowardly malignity and splenetic envy that has been, by and large and down the ages, the hallmark of the troll whether under a bridge or on the net. What is interesting to consider in the age of the revenant troll is where they are congregated. Their anonymity and diversity makes this a forlorn task but the very depth and extent of their trademark hatreds and the narcissistic intensity of their inward turning consciousness occasionally, under certain conditions and in certain contexts, reveals itself like a shaft of the sunlight so much reviled by the ancient trolls. Where can such a trollific concentration be found? Well: 'A casual glance at a national broadsheet or the nightly news during a sitting week would give the impression that Australia's parliament is more hyper-aggressive, rude and driven by personal hostilities than ever before. After an unclear election result in 2010 the public was promised a "kinder, gentler polity" (Grattan 2010). 'Yet, public debate about parliament suggests that the current parliament is neither kind nor gentle. Instead it is imbued with both scandal and paralysis ... Many MPs ... have stated that that behaviour is worse now than ever before.' ('A more aggressive Parliament? An examination of Australian Parliamentary behaviour 1996-2012', Australian Political Studies, 2013). The five years since this study was completed have produced if anything an even more spectacularly scandalous, intermittently paralysed, rough, devious and ungentle Parliament than was examined from 1996 to 2012. This is quintessential trolling without the anonymity: note the carefully timed last four words: I am in control here, they are saying, and I will do you in. (Though, in true troll style, she opted on her next appearance for anonymity by hiding behind white boards: her version of being under a bridge.) As this research has shown, and as anyone taking even a cursory interest has seen, there have been many other such parliamentary examples in the past decade or so. Parliament's counter to this kind of demeaning behaviour is the Westminster System, but under 21st century pressures that's proved about as useful as a troll alert. Amongst a plethora of robust, and wonderfully articulate, sentences surely the standout is the sentence beginning with "Their anonymity and diversity..." I was also confronted with "I. Will. Do. It. (sic)". Reading this led to a spasm of coughing. In searching for information about the Westminster System, my Penguin Encyclopedia revealed these entries - "Westminster, City of", "Westminster, Palace of", "Westminster, Statutes of". The Palace is of course the Houses of Parliament. The entry for "troll" - a huge ogre. The trolls are definitely under the bridges of Canberra. But why single out politicians (nonetheless deserved)? On ABC Radio 774 this morning, Jon Faine asked the question about why there is a breakdown in ethics across our whole society: politicians, banks, cricketers, unions, tax avoiders ....the list goes on. The only crime is getting caught! Not even 'honour among thieves' any more! There seems no doubt that many of the values of the "good old days" have taken a beating, if not been afflicted with a terminal cancer. Nevertheless, on this issue, I see signs that some at least are not dead yet. While there are many more matters of world importance than this ball-tampering scandal, never can I remember an experience such as I found today. Not only was the topic dominating the news and the talk-back radio, but in journeying into Melbourne CBD I heard people expressing their disgust on the train, walking along Swanston St, in the foyer awaiting a musical performance at the Arts Centre, and even two strangers (other than myself) finding themselves in close proximity in the mens toilet!